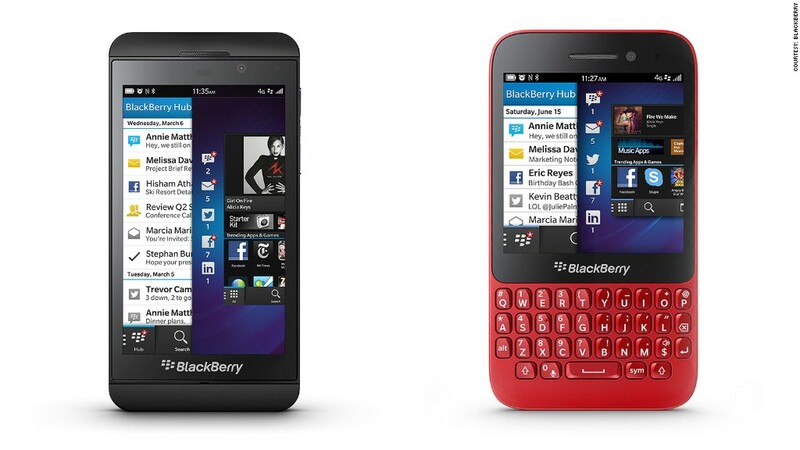 The Z10 and Q10 are the first devices to launch on BlackBerry 10. The company's future hangs on the success of the long-delayed platform. BlackBerry has run out of excuses. Its new phones are simply not a hit. The Canadian smartphone maker posted a surprise loss after shipping just 2.7 million new BlackBerry 10 devices in its fiscal first quarter, which ended June 1. Wall Street analysts had widely expected a profit and about a million more smartphone shipments. As a result, BlackBerry (BBRY) shares tanked 28% on Friday. The long-delayed BlackBerry 10 operating system finally launched in January with the all-touchscreen Z10. The sleek phone and modern OS were supposed to be the cornerstones of a BlackBerry turnaround after the once-leading smartphone platform fell into fourth place behind Apple (AAPL), Google's (GOOG) Android and even lowly Microsoft (MSFT). That hasn't happened. BlackBerry 10 devices made up just 40% of the company's smartphone shipments in the period --the first full quarter that the new phones were on sale. BlackBerry lost $84 million, or 13 cents per share. Analysts polled by Thomson Reuters had forecast a profit of 6 cents. First-quarter sales totaled just $3.1 billion, short of Wall Street's expectation of $3.4 billion. Continued talk of transition: Despite the troublesome report, BlackBerry CEO Thorsten Heins struck an optimistic tone on a conference call with analysts on Friday. Heins spoke of "investing in growth, a "foundation of innovation" and being "still in our launch cycle." Heins also defended BlackBerry's heavy spending on the BlackBerry 10 launch. "We want total penetration of the market ... to do that you need to invest in marketing, you need to invest in promotions," Heins said. "And we're not done yet. There's more exciting devices coming, and we will spend to market those as well." With the company's focus shifted to its core devices, BlackBerry said Friday it is essentially giving up on one long-struggling piece of hardware: the PlayBook tablet. Heins revealed the PlayBook will not receive an update to BlackBerry 10. A spokesman for the company said BlackBerry "will still support the current configuration." Outlook: Given the "highly competitive" smartphone market, BlackBerry said it expects to post another loss for the current quarter. The company's shares have largely soared since last November, when the company announced the platform was finally, truly coming in January. But that runup is partly because many investors are still betting against BlackBerry. As of June 14, nearly 35% of shares were held by short-sellers who think that BlackBerry's stock will fall. That's an extremely large percentage, and it has contributed to BlackBerry's wild swings as "shorts" are sometimes forced to buy up shares in order to cover their positions. What's next for BlackBerry: BlackBerry recently announced a software management program for automakers and a "Secure Work Space" system that lets enterprise iPhone and Android users to toggle between personal and corporate modes. Though Heins didn't rule out any "long-term strategic" changes for the company, he said he won't make BlackBerry a software-only company anytime soon. That's because Blackberry customers look at the company as "an end-to-end solution, including the device," Heins said. Meanwhile, a second BlackBerry 10 device -- the Q10, which features a BlackBerry-classic QWERTY keyboard -- launched in only a few markets last quarter.